Escape to Destin, Florida for the beautiful beaches, sugar white sands, and year-round warm weather. Griffin’s Getaway, nestled in the gated Caribe community, offers space for eight stretched out over two luxurious stories. 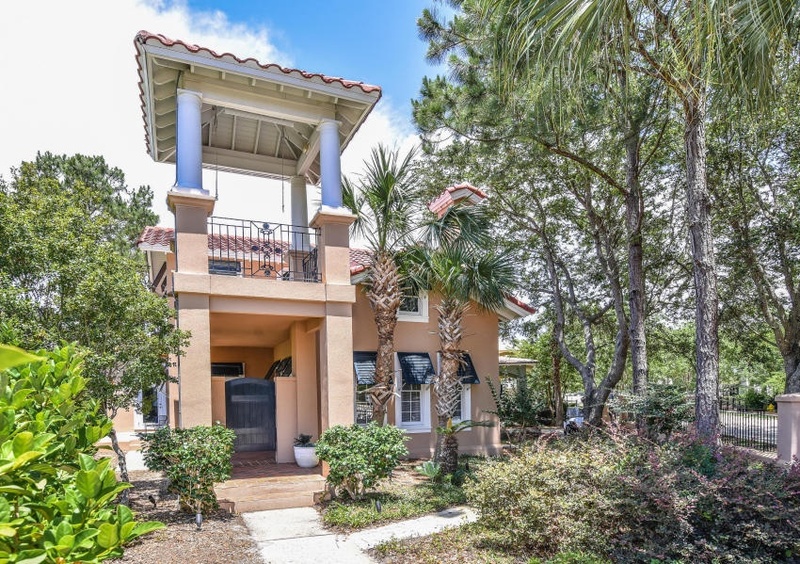 With four bedrooms, three bathrooms, and an extra room in the carriage house, everyone is sure to be plenty comfortable in this Destin vacation home. Also during your stay, enjoy complimentary in-season beach service! Upon arriving at Griffin’s Getaway, a cozy patio area invites you to relax with a cup of coffee. Inside, take in the vaulted ceilings and bright light pouring through. You’re sure to love the kitchen, as it comes decorated with granite counter tops and stainless steel appliances. Also, on the first floor discover the second and third bedrooms, along with the second bathroom. Then, head up to the second floor and discover the master suite. After a long day under the sun, ease into the whirlpool tub to relax and refresh your mind. This spacious bedroom features private balcony access, with a view overlooking Caribe’s water fountain. Griffin’s Getaway also features a one bedroom, one-bathroom carriage home for extra privacy. If you’re traveling with kids in your group, they’ll love feeling like they have their own private vacation home. Complete with cozy living room accommodations, a kitchenette, and a sauna with space for two, the carriage house is a perfect addition. Meanwhile, be sure to enjoy Caribe’s community amenities during your stay. The neighborhood features two pools located close by Griffin’s Getaway, along with lighted tennis courts and direct beach access a short walk away at the end of Rue Martine. Miramar Beach also features a ton of activities the whole family will love, from surf lessons right on the beach to shopping at Silver Sands Outlet Mall. Be sure to also check out our Gulf Coast Guide for more fun things to do in Destin. So, if a beach getaway has been on your mind, then reserve Griffin’s Getaway with Southern today!